Would-be graphic designers rejoice: Adobe has an app designed just for your smartphones. Announced today, Photoshop Touch for mobile brings the core functions of Photoshop to the form factor of a phone. Those who've been paying attention will know that Photoshop Touch for tablets has been around since last year, though Adobe has planned about bringing the app to life on handsets ever since. "We wanted to make the app more accessible and available for situations where you don't have a tablet available," Stephen Nielson, product manager at Adobe, told TechRadar. "We wanted to bring the same core features of Photoshop to millions of pockets worldwide." The app features are virtually identical features as Touch for tablets, yet shrunken down to pant pocket size. Users can utilize layers, advanced selection tools, adjustments and filters as they manipulate images taken straight from their phone's photo gallery or redacted from the cloud. The app can edit images as large as 12MP with layers. There's also a phone optimized version of Scribble Select that allows for precise selections and cropping even with a finger. The Camera Fill feature lets users blend layers in real time using their camera as well as add textures. 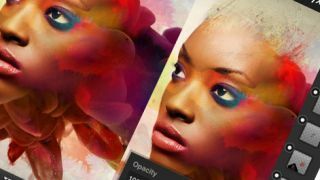 Adobe has gone to great lengths to make sure everything is accessible within a thumb reach: tool bars around the perimeter make for quick swipes and taps to all the image manipulation tools you'd expect of Photoshop. What would be mobile without easy share options? Touch users can quickly post their creations to Facebook and Twitter or send via email. Though Photoshop tends to run in fairly graphically advanced circles, Nielson said that the mobile app is appropriate for someone who doesn't just want to apply a filter to a photo. "Photoshop Touch is more of an advanced app in a lot of ways," he said. "You can do a lot more with it than any other app, but it does require a little more learning. You can pick it up very quickly, though." When asked if Adobe is trying to do a little jockeying with Instagram, Nielson noted that what is central to the social site isn't Touch's focus. "Our focus is the core features of Photoshop – the layering, advanced selections. It does include filters and adjustments, but those aren't the core features. "We have some unique features, like more transformative tools that transform an image into something different rather than overlaying a filter." What really stands out with Adobe's app offering is the ability to start a project on a desktop, tinker with it on a tablet, then finish it off and share on a phone. Flip the steps around or skip from one to the other, it doesn't matter thanks to the Creative Cloud. If users do start a project on their phone, the image is first saved there and then is transmitted to cloud storage (there's even a loading bar to let you know when the transmission is complete). Though there are several cloud subscription models, ranging up to US$50, a free cloud account comes with 2GB of storage. The app will work on iPhone 4S's and higher and Androids running Ice Cream Sandwich or later. iPod touch (5th generation) owners can also get a taste of Touch. Except for China, the app is available through the App Store and Google Play for US$4.99 globally, though Adobe noted there may be some lag time between the initial announcement and availability. Check out our hands on review of the app to get a feel for its function.